Are you looking to add a little je ne sais quoi to your practice routine? Maybe you want to practice à la française? Or maybe you just want to learn the Francaix Concerto or the Debussy Première rhapsodie, but don’t know where to begin? Say no more! 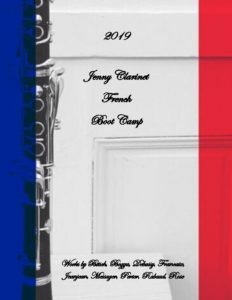 I’ve created the 2019 Jenny Clarinet French Boot Camp, a 12-month practice plan centered around learning standard French repertoire and etudes! Each month contains a different method book or solo work, which I have organized into daily assignments. (Here is a sample boot camp.) Each month includes instructions and advice for each book or piece. If you follow my boot camp, you’ll complete one book, movement, or piece each month in 2019 – oh là là! In addition to the daily boot camp calendar, you’ll get a guide with tempo suggestions, practice tips, and monthly French clarinet and music trivia! So, if you want to take a little French vacation without even leaving your practice room, the 2019 French Boot Camp is for you! The 2019 French Boot Camp costs $12 (only $1 a month, or the cost of your daily baguette in Paris!). All pre-orders made by December 10th will receive a 10% discount, making the cost only $9 for the 12-month program. I’ll begin sending the digital copies of this boot camp on December 10, so place your orders today! 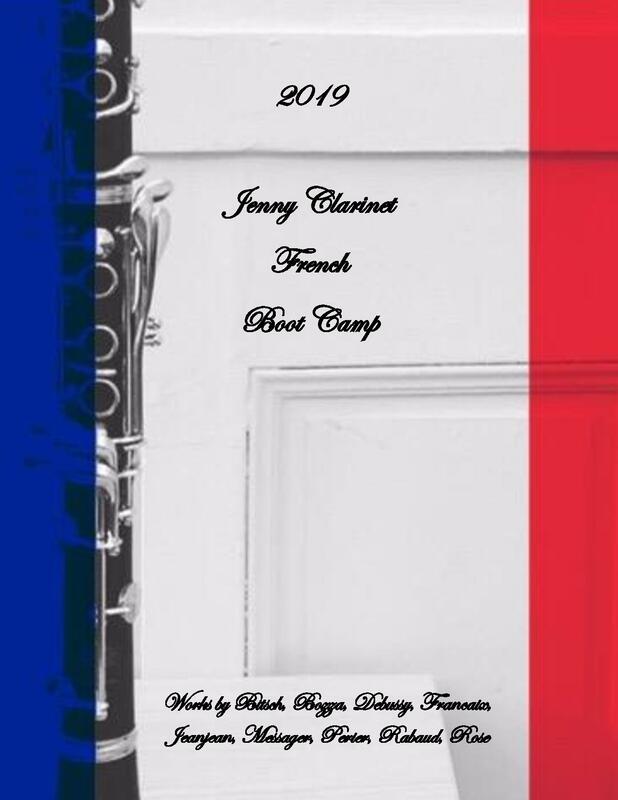 If you would like to purchase the 2019 Jenny Clarinet French Boot Camp, please contact me using the Contact page on this site or contact me through Facebook or Instagram and I will send you the PayPal payment instructions. Speaking of the French clarinet, do you still plan to publish Phillipe Cuper’s scale studies for clarinet? It would be great to have a copy. I do! It’s been on the back burner for some time now, but I hope to publish it soon! I am not sure if I am suitable for your boot camp, I am a 74 year old self taught player and consider myself reasonably competent but not advanced, I have recently discovered the Carl Baermann books and am struggling with bars 16 from the breath mark to B of etude No 19. This I include to give you an idea of my level. I tend to prefer slower pieces than those that gallop away from my fingers. I would love to join the boot camp if you think that I could cope. I do recognise that I have ambitions above my pay grade so please do not worry about turning me down if you think I couldn’t keep pace. Sorry for the much-delayed response! The boot camp can be adjusted to all levels, but you might not complete each book or piece within the 30-day prescribed period. The goal of the boot camp is to introduce clarinetists to new repertoire and etudes (and in 2019, all French works!). Let me know if you think you would be interested and I can give you more information. Dear Jenny, have only just come across your page as I have only recently returned to playing the clarinet after nearly a 20 year absence. I am only an intermediate player level. Would this program be within my playing level. Looking to improve my abilities and level of playing.